He has made a massive impression on the public and Time magazine yesterday announced that he was one of the 100 most influential people in the world. A ConservativeHome poll of Tory members finds that his role in the ousting of Sir Ian Blair was his most important act since replacing Ken Livingstone. Freezing council tax, banning alcohol on the Tube, opposing a third runway at Heathrow and opposing an extension of the congestion charge also feature prominently. In recent days Boris has announced a plan to devolve more power to local government in London. He has also been in the newspapers for apparently wanting to be Prime Minister after he has finished at City Hall. Last Saturday he told ConservativeHome that talk of him despising David Cameron was "tripe". He also said that the London Mayor job was "almost certainly" his last big job in British politics. Not many Westminster insiders believe him. After some early difficulties with staff picks he is carving out his own brand of modern Conservatism in London. He has annoyed traditional Tories by expressing sympathy for an amnesty for illegal immigrants but delighted others with his fierce opposition to higher taxes on London's wealth creators. Speaking to ConservativeHome he says that his record shows that "you can cut public spending if you really want to." He said that he was very proud of the team he was building at City Hall and that he was proving that better services could be delivered while freezing Londoners' council tax. He said that he was most proud of the efforts that he had made in fighting crime. London was getting safer and safer, he said, and putting more police officers on the beat and into the transport system would remain a top priority. He issued a "massive Mayoral apology" to me after I told him that my fourth bike had been stolen - just last month. He promised a rent-a-bike scheme soon that might solve my problem. The environment would be a "passion" in the remainder of his term, he promised, and he hoped to make substantial progress in sponsoring Electric Cars across the capital. Being London Mayor had so far been a "fascinating and demanding" experience. It was the most rewarding thing he had done in his life. He had very few frustrations although the London bureaucracy was sometimes "treacly". "I want to stand for a second term" he said but had not taken a final, final decision. The Tories are currently 12% ahead in London but he will be running for re-election in what is likely to be the mid-term of a Cameron government and the Tories might be unpopular across the country because of painful decisions on the budget deficit. Boris has made a great start but re-election won't be a cakewalk. Boris attacks 50p tax band as an "assault on London"
Boris Johnson's office has released a press statement condemning the 50p tax rate as "an assault on London". Research by the Greater London Authority says that 145,000 Londoners will be hit by Darling's "banker taxes". That 145,000 includes those earning £100,000 and affected by changes to allowances. "Our capital is the engine room of the UK economy, generating 17% of the UK’s GDP each year and yet our figures show that the Government’s plans for high earner taxes will hit London four times harder than the rest of the UK. Penalising high earners with higher taxes could undermine London’s competitive edge. It runs the risk of driving highly skilled workers away from and deterring others from coming to our great city – which is a real concern to me." Being Mayor is "almost certainly my last big job in British politics"
Speaking exclusively to ConservativeHome Boris Johnson has acted swiftly to dispel speculation that he is antagonistic towards David Cameron and is planning to become Prime Minister. Being London Mayor is "almost certainly my last big job in British politics" he said. He went on to describe The Times' report that he "despised" David Cameron as "obvious tripe" and "fantasy". Anyone who knows us would know it was tripe, he continued. A desperate Labour Party and bored media was inventing "unimaginative" copies of the Blair-Brown tensions and applying them to the Conservatives. It was "pathetically schematic". I am "utterly dedicated to London" he said. 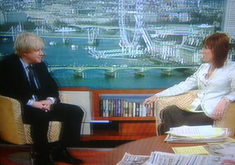 There'll be more of ConHome's interview with Boris Johnson on his first anniversary. We have come to the end of an historic week in British politics. Coming on top of Smeargate we have had revealed the full extent of Labour's economic failure. On Wednesday the Budget revealed the extent of Labour borrowing. Today we've seen the depth of Labour's recession. I expect Tory leads to be large from now on - perhaps as large as yesterday's YouGov lead of 18%. There is now a massive expectation of a Conservative victory. 98% of Tory members expect David Cameron to be Prime Minister in ConservativeHome's April survey. With this expectation will come enormous scrutiny from the media. The Tories have not faced serious examination yet. That's going to change. Much of it will focus on Tory policy but much will inevitably focus on the personalities that will soon be governing Britain. Two relationships within the Tory family will face most scrutiny; the Cameron-Osborne relationship and the Cameron-Boris relationship. The scrutiny begins tomorrow. The Times alleges that Boris Johnson "despises" David Cameron. In return Mr Cameron is said to think that Mr Johnson is "lacking the necessary moral cut-out or alarm system to be a serious politician." Strong stuff. It's true that Boris Johnson was disappointed that his early support for David Cameron was not rewarded with a bigger frontbench job when the latter became Tory leader. It's true that Mr Cameron was initially sceptical about Boris' credibility as a Mayoral candidate. Boris then resented George Osborne's (necessary) interventions in his Mayoral campaign. Beyond that I wouldn't want to speculate. Whatever the differences of the past it's vital that the three men at the heart of the Tory project - David Cameron, George Osborne and Boris Johnson - work out a way of getting along. The media are keen for endless TB-GB-type rows. That mustn't be allowed to happen. None of the characters have the psychological flaws of Gordon Brown. Brown's treatment of Tony Blair was extraordinary. Boris and Cameron both enjoy very high satisfaction ratings among Tory members. 91% of Tory members are satisfied with David Cameron (7% dissatisfied). 92% of Tory members are satisfied with Boris Johnson (6% are dissatisfied). But Boris should also reflect on another ConHome finding that 43% think he is not a credible candidate for Prime Minister even after he has been London Mayor. They appear to be happy with his performance at City Hall but are sceptical that he can go right to the top. He needs to focus on being a successful Mayor. At that he's made a great start. 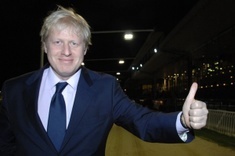 Boris Johnson: Tax cutter and... future Prime Minister? Today's Spectator can rightly be called the "Boris Johnson issue", containing as it does a selection of pieces about its esteemed former editor, timed to coincide with the impending first year anniversary of his arrival in City Hall as Mayor of London. And of the various contributions, Ross Clark makes an especially important point. Headlined "The only tax-cutting Tory in town", he notes that the Mayor's "greatest achievement' so far has been to make a real terms cut in the amount of money he is costing London council tax payers by freezing the Greater London Authority precept. "In a recession, when income from the congestion charge has fallen sharply and energy costs are high, freezing the GLA precept is a remarkable achievement which deserves to be better acknowledged... There is no smoke and mirrors about Boris’s tax freeze. It really has been funded by spending cuts... which have elicited virtually no audible response. " Amen to that - and I trust David Cameron and George Osborne will ensure that the party nationally takes time to look at how he did it. "The phones went wild. The emails and the letters started to swamp our response teams. People started crossing the road to shake my hand, pumping it up and down and thanking me with embarrassing fervour. I felt like some Texan prospector who has idly whacked his pickaxe on some piece of unpromising ground and then stood back in amazement before a great gusher of erupting oil." "If there is one thing that marks us out and defines us, it is the language, the greatest, the most fertile and the most stunningly successful language the world has ever seen. The Germans may beat us at music; the Italians have the edge in painting – but the English beat all comers at poetry, and that is why it is right that we should celebrate St George’s Day in April. It is not only the month that inspired Chaucer and T.S.Eliot. On Thursday we also mark the birth of William Shakespeare, the man who mobilised that language more effectively than anyone before or since. So why is English so formidable? Why does it knock Mandarin into a cocked hat? Because it has twice as many words as either French or German. There are 500,000 words in the dictionary, and that is because it is a confluence of the two great streams of Romance and Anglo-Saxon. It is a mongrel language, a language that shamelessly and brilliantly continues to absorb imports from around the world. That is why it is so fitting that St George is himself an import. Like my ancestors, it turns out he was a Turk, and it is testament to the generosity of the English that we have made him our saint. According to Gibbon, he had nothing to do with a dragon, but was a Cappadocian merchant who made a fortune selling bacon to the Roman army. What could be more appropriate? Napoleon said the English were a nation of shopkeepers. He meant it as an insult. We take it as a compliment. It is that spirit of small-business entrepreneurship that encouraged St George to flog his bacon to the Romans and will lead this country out of recession. So come on out and celebrate the multi-faceted genius of this country, and cry God for Harry, England and St George the seller of bacon!" Pasted below is a photograph of our candidate in Harlow, Robert Halfon. Yesterday he circulated a leaflet in the town centre of the Essex new town calling for St George's Day to become a public holiday. The leaflet is going to every home in Harlow. Not long after taking office as London Mayor, Boris Johnson discovered that his predecessor (perhaps not that surprisingly) had never installed a portrait of the Queen at City Hall. ConservativeHome is therefore delighted to reveal that this shameful omission is finally to be put right next Monday, which is the eve of Her Majesty's 83rd birthday. 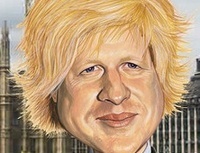 Boris himself will be unveiling the portrait and we will be sure to post a photograph of the occasion on the site. "This McBride has been in charge, since September, of government strategy. He is meant to be coming up with ways of helping people through the recession. And what do we have? A load of pathetic and invented smears, with McBride egging on the blogs to mount false attacks not just on MPs but on their wives. It is contemptible, and it is a function of the bunker-like desperation in which the Prime Minister and his allies now find themselves. In their relentless, brutal, tribal viciousness they are no longer interested in doing good for the country, but only in doing down their opponents. They have lost their moral case to govern the country. They must go." Boris Johnson has cut 120 posts at City Hall today as part of restructuring plans. The London Evening Standard reports that "The Mayor wants to save about £7.5million from an £80million budget by the cuts, many of them middle managers earning about £40,000." That's 9.4%. The Standard continues: "The main cuts are expected to be among administration staff. Short-term contracts will not be renewed." I suspect that similar overstaffing exists across much of government. "Resources, led by finance director Martin Clarke. External Affairs, headed by Guto Harri, director of communications. Communities and Intelligence which will receive policy advice from Kit Malthouse, deputy mayor for policing. Development and Environment, advised by Sir Simon Milton, deputy mayor for planning and policy." "It sends out a signal to people who create wealth, people who are energetic... can generate new industries or drive large enterprises of one kind or another... that we want to take more of their proceeds away than before. It is a deterrent to enterprise." That was the Mayor of London on last night's Any Questions? programme on BBC Radio 4. George Osborne has said Labour's tax rise will be "difficult to avoid". Mr Johnson said that "clobbering the rich" would stifle the City's potential. On this morning's Today Programme George Osborne confirmed that it is likely that he'll keep Labour's plan to introduce a 45p tax rate for those earning over £150,000 in 2011. You can listen to the entire interview on the BBC website. (This ToryDiary has been altered since going live at 9am to take account of Boris Johnson's intervention). It was Andrew Gilligan's drip-drip of damaging allegations in the Evening Standard about how Ken Livingstone spent public money on a variety of dubious projects and causes which did so much to undermine him towards the end of his tenure as London Mayor. Well, as if to help prove that he was no place-man supporting Boris Johson's bid for the mayoralty, Gilligan would seem to be paying equal attention to how the new administration at City Hall is spending our money. He has today published an article suggesting that a Muslim group run by an "extremist" has benefited from public funds to the tune of £30,000 since Boris was elected Mayor. "Mayor Boris Johnson has given at least £30,000 of taxpayers' money to an organisation co-controlled by an Islamist "extremist", the Standard can reveal. Azad Ali praises a spiritual leader of al Qaeda on his blog, denies the Mumbai attacks were "terrorism" and quotes, apparently approvingly, a statement advocating the killing of British troops in Iraq. "He also criticises those Muslims who "tell people that Islam is a religion of peace". He describes non-Muslims as "sinners" and says Muslims should "hate [non-Muslims'] disbelieving actions". Mr Ali is the founding chairman, and current treasurer, of the Muslim Safety Forum, a group that has received at least £30,000 from City Hall since Mr Johnson's election last May." "The Mayor is very concerned to discover that taxpayers' money has gone to this organisation.The commitment was made by the previous Mayor and the agreement was in place before the election. The Mayor has ensured that no further payments will be made when the outstanding agreement is concluded." It is reassuring to know that this does not appear to be something for which Boris can be held responsible, but it should serve as a reminder to him - and all those with the power to distribute public funds - that they are being scrutinised and that taxpayers expect the money they have been forced to part with to be used both wisely and responsibly. Tonight's Panorama programme will reveal that the number of illegal immigrants in London and the UK are well above previous estimates. The latest estimate is that in 2007 there were between 524,000 to 947,000 illegal immigrants in the UK (central estimate 725,000). Previous estimates of illegal immigrants in the UK in 2001 were 310,000 – 570,000 (central estimate 430,000). Boris Johnson will tell the programme that, in the absence of a credible deportation regime, he is open to the regularisation of these illegal immigrants so that they pay taxes (not something they currently do) in order to pay for their use of public services (something they do currently do). Mayor – ‘It's extremely expensive to deport migrants, let me be clear I am in favour of sending them back but we must be realistic. We need to do two things simultaneously if we are serious, first we need to tighten the borders, we need to be much more robust because we don’t know who is here, it's crazy. Secondly we need a frank debate about what to do with the half a million who are not able to join the economy legally but are not allowed to make contribution to society and make case for earned amnesty, if they have been here for a long time and it looks like and if they can make a contribution they should be given the chance to regualrise their status.'" "We should shoot one banker a week until the others improve." He confirms he'd like to run against Boris Johnson in 2012 but Tory members see Sir Alan Sugar as a potentially more formidable Labour candidate. This was the percentages from our recent monthly survey answering "Who do you think would be Boris' most dangerous opponent in 2012?" David 'Mastermind' Lammy was written in most often in the 'Other category'. The same survey of Tory members found great optimism about Boris' re-election hopes. 76% thought it was quite likely; just 5% unlikely and the remainder saying "it's too early to tell". I'm with the "too early to tells." When Boris won last year the average Tory poll lead was 12.2% in the ConHome Poll of Polls. As blogged on Sunday Boris could be facing re-election two years into a Conservative government that is making tough judgments on tax and spending. In the second result of our February survey of Tory members (first here) 40% of Tory members say that it's too early to say if Boris Johnson has the qualities to be PM. The exact wording was: "Do you see Boris Johnson as a credible candidate to be Prime Minister after he has served as London Mayor?". Of those who have decided, however, a clear majority are sceptical. Over 70% say no. Most of the polling was carried out before reporting of Boris Johnson's F-word outburst. Overall, 89% of Tory members are satisfied with the Mayor's performance and just 5% dissatisfied. For David Cameron 86% are satisfied and 12% dissatisfied. Where are the politicians who are telling us the truth about the depth of the economic and social challenges facing Britain? In an occasional series we'll highlight those big beasts who stand up and tell the truth. "It is incredible but true that the average public sector wage is now higher than the average private sector wage; and public sector pensioners can still generally expect a final salary pension scheme – and these can be very generous indeed. In local government, for instance, you can expect to be awarded one sixtieth of your final salary for every year of service. So if you are a chief executive or other senior official, on a salary of more than £200,000, and you have worked for 30 years – well, you do the maths. It is a very generous deal, and speaking as a former MP and current Mayor, I hesitate to knock it, and I only do so because it is unsustainable. With firms now laying off staff in their thousands, with unemployment apparently set to hit three million for the first time since the 1980s, it is simply too much to expect council-tax payers to scrimp and save to pay for the pensions of local government's colossal clerisy, when those pensions are so much more comfortable than anything they could afford themselves." MPs Brian Binley and Mark Field also deserve credit, of course. "As the economy staggers through its worst downturn for nearly 30 years, much will be made of how the development of “green-collar jobs” will renew our manufacturing base and lead the economy to new fields of prosperity. This is, sadly, all too likely to be wishful thinking as we generally do not have the technology or the manufacturing capacity required for such a “green revolution”. Nuclear technology (which in the green lexicon does not even count as “green”) is dominated by the French; wind technology, biomass, solar technology is dominated by the Germans and Carbon Capture and Storage (probably 10-15 years away commercially) is also dominated by the Germans. Electric vehicle and hydrogen fuel cell technologies are dominated by the US, Germany and Japan - and are in any case estimated to be around 20-30 years away commercially. We really must not fantasise. And in the meantime the increasing burdens of “green” electricity costs will drive our energy intensive industries, including steel and chemicals, offshore." It's a vital question because whenever voters have been asked to pay for environmental protection in recent times they have answered 'no thank you' - from Canada to California to Manchester. Irwin Stelzer notes green campaigners' fury at the inclusion of more coal-fired power plants in Barack 'great green hope' Obama's controversial stimulus package. "It is not the right time to press ahead with extending it to include smaller vehicles like vans and minibuses. Many of these will be owned by small businesses, charities, and self-employed Londoners already hard hit by the recession. Simply put, the cost of fitting pollution equipment or getting a new vehicle would have come as punch in the ribs to those who need our help at this time, would have destroyed profit margins, and endangered our businesses." London's Green Party called the decision "an absolute disaster for London's environment". "It's easy to cut emissions by destroying jobs. The real challenge is to get less pollution and more jobs. Local initiatives are - properly - a matter for local, not central, government. In this case the Mayor of London proposes to continue his current low emissions scheme, but, rather than widen it to penalise smaller vehicles belonging to small businesses, instead to boost the market for innovative alternatives such as electric vehicles, low-emissions taxis and hybrid buses. That way, he can help create jobs and cut emissions." We need a serious and big picture statement from Greg Clark or even David Cameron himself on how they plan to reconcile their extraordinarily ambitious targets to cut the UK's carbon emissions with the number one priority of the British voter; a return to job-creating, income-enhancing economic growth. 8.30pm Matt Sinclair on CentreRight calls on the Conservatives to abandon "the more ineffective and economically destructive of Labour's environmental policies". "This is a momentous day and I'm proud to raise the US flag over City Hall. As an Englishman, born in New York, as an elected politician, as a democrat and addict of history, I'm inspired by the prospect of this great man entering the Oval office. 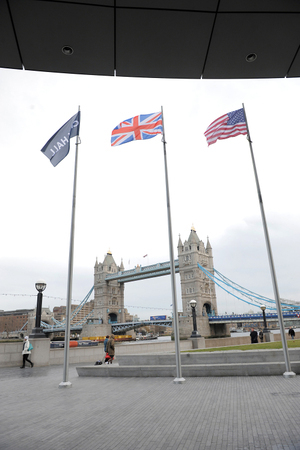 We in the United Kingdom will always share a unique relationship with the United States. But the inauguration of Barack Obama, as the 44th President, is a cause for a very special celebration." But - for those who aren't Obama fans - there's always Melanie Phillips. This morning's Independent on Sunday reports that Boris Johnson used public funds to pay the hotel bill for him and his entourage at the Conservative Party Conference in Birmingham. Some are suggesting that this breaches section 6(b)(ii) of the GLA code of conduct which states that the mayor "must, when using or authorising the use by others of the resources of your authority,... ensure that such resources are not used improperly for political purposes (including party political purposes)". Whereas Ken Livingstone did attend the conferences of the various parties in his capacity as mayor, Boris Johnson did not go to the Labour or Lib Dem gatherings, fuelling the claim that his attendance in Birmingham last autumn was party political. He has just appeared on BBC1's Andrew Marr programme (presented today by Fiona Bruce) and defended his use of taxpayers' money to pay the £1,955.25 bill. "As far as I am aware, it is usual for mayoral delegations' bills to be paid by the GLA... The mayor goes to party conferences and there's no reason why his bill should not be paid by the taxpayer... I don't believe it is proscribed by our rules of conudct... if it is I will certainly pay it back." "Oh boy, you know what conservatism is. Do I have to describe it? A belief in the old ways of doing things and all that sort of jazz." A classic Boris soundbite from an interview for the Wall Street Journal. PS We hope you didn't miss Boris' New Year message. Our fifth 'picks'. Already picked are our Backbenchers, Frontbenchers, Moments and Speeches of 2008. Jonathan Isaby's pick: 2009 is the year when the pledge made by David Cameron during the 2005 leadership election to pull Conservative MEPs out of the federalist European Peoples' Party faction in Brussels should finally come to fruition. The man who has been doing the most behind the scenes to seek new alliance partners across Europe is Mark Francois, the shadow Europe minister. There's another six months' work to be done on this before the European elections, after which we will discover which political parties from across the continent are willing to sign up to a new grouping. European Parliament rules have been designed to frustrate the project - but if Mark can pull it off, he will attain folk hero status among Tory eurosceptics. Who would you pick out as the one to watch in 2009?